Anyway, back to brunch. Is there anything better than a poached egg over polenta? I think not. Southerners have it right with their eggs and grits. This is just a fancy pants version with sauteed onions and fresh breadcrumbs toasted in truffle oil. Yes, you read correctly. Truffled breadcrumbs. My new favorite food. And this dish is my new favorite brunch. 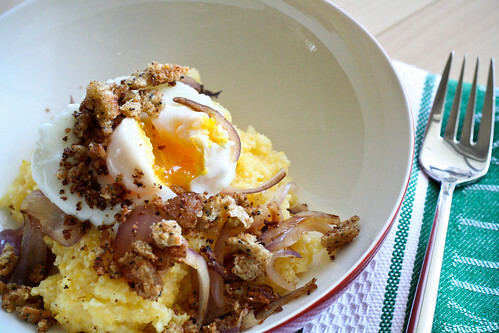 Creamy polenta and drippy yolk contrast perfectly with the slightly sweet sauteed onions, and truffly toasted breadcrumbs. If i had all the money in the world, I would have topped it off with shaved truffles. Sadly, there were no truffles lying around my apartment. If you’ve never had poached eggs and polenta, you haven’t lived. Make them for breakfast, lunch or dinner. Bonus points for truffled breadcrumbs, but delicious either way. Start by making your polenta. Place the polenta, salt and water in a medium-sized sauce pan over medium-high heat. Once it comes to a boil, cover and reduce the heat to low. Let simmer for 25 – 30 minutes, stirring occasionally. While the polenta cooks, prep the breadcrumbs and saute the onions. Set a skillet over medium heat. Once it’s hot, add 1 tbsp. of the truffle oil, then add the onions. Saute until soft, about 7 minutes. Remove the onions to a plate and set the skillet aside (you’ll use it again). If your bread slices are not dried out, toast them in your toaster. Remove to a food processor and pulse until you get small, but not fine, breadcrumbs. (If you don’t have a food processor, chop the toasted bread up as best you can with a knife.) Return the skillet to medium heat and add the remaining tablespoon of truffle oil. Once it’s hot, add the breadcrumbs and toast until deep golden brown, stirring continuously, about 3 – 4 minutes. Remove to a plate. Finally, poach your eggs. I like to use the method described below from 101cookbooks. At the point, everything should be ready to go. Assemble you plates by placing 1/4 of the polenta on plate, top with 1/4 of the onions, 1 poached egg and a big sprinkling of breadcrumbs. Serve immediately. Gently crack egg into a ramekin, carefully slip it into a mesh strainer over your sink – some of the whites will run through and strain off (if the mesh is too fine, you won’t get the desired effect). This minimizes the fly-away whites you normally get. Now, carefully slide the egg back into the ramekin. Lower the ramekin down into the simmering water and let the egg slip out. Let it simmer there for a few minutes, past the point when the whites have become opaque. If you like a loose yolk, cook for less time. Remove the egg with a strainer or slotted spoon and … set aside while you repeat the process with the remaining eggs. Mmm, eggs over polenta? Fab! Looks great! I would eat this for lunch or dinner as well. Funny because I have been so into poached eggs on top of things lately. My last post featured one. Beautiful photography. Can’t wait to try this… “Truffled Breadcrumbs”… YUM! This sounds and looks too good. Thanks for sharing! Interesting technique for poached eggs w/o flyaway whites. Thanks for including that. So very YOU to take the breadcrumb prep over the top by toasting them in truffle oil. This is a dish well worth shedding shoes for, warm weather or not. No lazy mornings “in” for too long here – will probably trot this out for a brunch-for-dinner experience. And SOON. I’ve been searching for this exact information on this topic for a long time.